If I were to graph the number of apps installed on any device I own since I got my first Android phone in the summer of 2011 (an HTC Inspire), it would be left-skewed. A combination of concerns about battery life and storage space, the realization that some websites offer better experiences than their respective apps (especially Facebook), and an overall desire to just have few sources of information has led to delete nearly everything but preloaded apps. What’s more, I haven’t actively searched for a new app in a while. I’m not sure if this says more about me being burned out on data and notifications (they feel so distracting, and I know I have written/read less because of them) or about the maturity of the app market. In 2009, I had my first brushes apps like Shazam and Grindr that offered something a lot different than what had been available from a PC or Mac. In 2010, I learned about Instagram and was for the first time jealous of people who had iPhones (I still had a dumb phone of some sort at that time). In 2012, I found out about Uber and was briefly enamored with it before it revealed itself as an ethically-challenged organization. But since then, there haven’t been many “a-ha” moments for me in using mobile apps. The ones I use every day are based on age-old phone conventions like being able to send text messages (starting with SMS and now evolving into iMessage, LINE, etc.) and photos. There’s also DuckDuckGo (a search engine, one of the oldest forms of exploring the Web), Lyft (since I can’t stand Uber), Flickr (for photo backup) and Tumblr (where I do some of my creative writing). 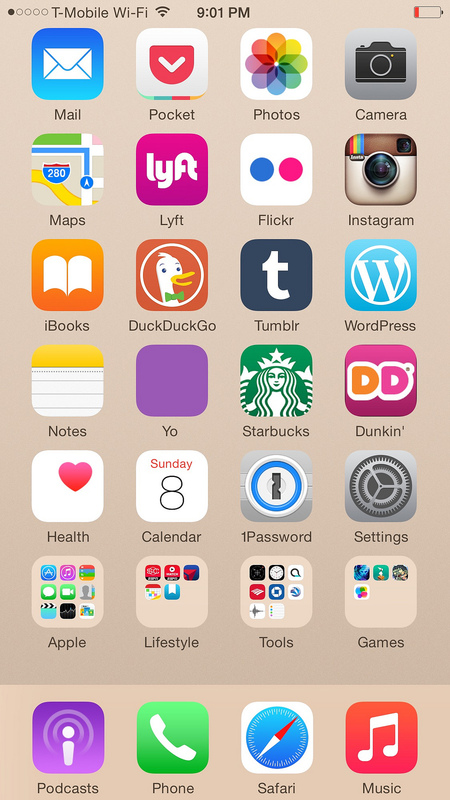 There are ways to pay for my coffee (Dunkin’ Donuts and Starbucks) and then there’s Yo, which is a novel way to get updates on RSS feeds, Twitter accounts, etc. Although it started a gimmick, I think Yo has a lot of potential. There’s Pocket, my favorite. And 1Password, which simplifies so many headaches. Part of the reason for the paucity of apps on my phone is that I have never been in love with social networking. With Tumblr, I can just publish from time to time and not worry about my real identity. But I steer clear of Facebook and Twitter on mobile since they just demand too much attention for too little return. I use Snapchat but have never used Secret (I don’t get it) or any dating app like Tinder (I’m married). In America, for someone born after 1980, there are so many barriers to meeting up with others unless: 1) you have a car; 2) have access to good public transportation. #1 is an issue for the cash-challenged Millennial generation, yet so much of American infrastructure – from sprawling parking complexes to office parks located in the middle of nowhere – assumes the ownership of one. #2 is surprisingly rare – I would venture to say that one can only comfortably be out and about in a city without having a car as back-up in exactly two American cities: New York and Chicago. What fills the void? 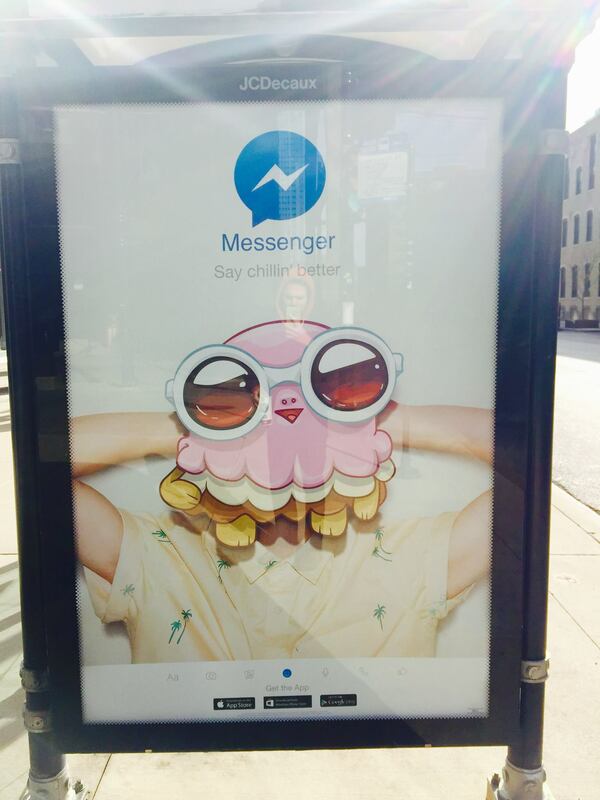 Social media and messaging apps. Maybe part of my own gravitation away from social media has been the fact that I have lived in one of these two cities for the past 7 years. Plus, no longer being single has also eroded a lot of the youthful fascination that once made, say, Facebook so exciting to use. It’s hard for anyone who joined Facebook after roughly 2006 or 2007 to know what it was like in the early years, when it was all single college students who send each other Pokes and edited each other’s Walls at will. Less social media (and storage space – I settled for a 16GB iPhone 6 Plus) has led to a pretty spartan, utilitarian home screen. But it’s also, I suspect, left me happier since I don’t have to keep tabs on others as part of a lonely suburban existence. Just started reading a Stephen King novel from 2006, “Cell.” Right before 9/11, I went through a phase in which I read most of his 1970s and 1980s work, before my reading time was taken up by more academic novels for English classes. I eventually got back into him in late 2011, ten years later, following the release of his novel “11.22.1963” about the Kennedy assassination. During my sophomore year in high school, everyone in our English class had to do a study about a literary author. I don’t remember whom I choose, but one of my best friends at the time picked King, a choice that our teacher initially balked at but acquiesced to after admitting that he had produced a “significant enough” body of work. I was jealous. Plus, I agreed with her final judgment – my experience of King superseded whatever criticism I had read about his work. The president’s iPhone and your iPhone are essentially the same, give or take storage capacity differences and coloration. There’s an attractive egalitarianism and homogeneity there. What I like about the above passage from “Cell” is how it hints at what’s to come: there’s the “exactly the same” haircuts, conveniently about the “iPod headphones,” which had already done to the MP3 player and headphones markets what iPhone would do to phones. Then there’s “Pixie Light and Pixie Dark” – it’s like “Cloud White” or “Midnight Blue” or “Space Grey” or “Gold” when buying a phone. Excited about this book already. Expect a few more entries, especially about its premise of mobile phones spreading an apocalyptic disease. I wrote an entry about Plants vs Zombies 2: It’s About Time earlier this year covering some basic strategies for making it through the game without spending anything. PVZ2 is the most carefully crafted free-to-play game I have played. It doesn’t even feel like a scam, since with a little planning and some fleet fingers you can make it through all stages with just the basic plants. This guide is more in-depth. I will show you one overarching strategy that works in almost stage. I’ll also look at each plant and rate it on a scale of 1-10. I’ll also provide tips for each individual stage in case you are stuck on one of them and want to move on without shelling out a few bucks for an overpowered chili pepper or some such. Plant a full column of Sunflowers in the backrow. Plant a column of Twin Sunflowers next to it. Eventually, you may want to swap out the Twin Sunflowers for Sun-shrooms. Begin planting Wall-Nuts or Infi-Nuts a few tiles back from the right edge. This way you have sometime before the zombies reach them, allowing you to build your defense and bombard them on the way. Use the Iceberg Lettuce to freeze zombies that you think are moving too quickly. Build some Snapdragons in a column behind the Wall-Nuts/Infi-Nuts. Each one makes a fire wave that covers three tiles. A full column can shell out incredible, cascading damage. Kernel-Pults! Build a whole column as far back as you can. Considering cost and effect, the Kernel-Pult is the best plant in the game. It deals decent damage by shooting kernels, but it is truly valuable because of its butter pats. These freeze the zombies for a few seconds. Ideally, built two columns of Kernel-Pults to increase the chances of stymieing zombies. The Kernel-Pult’s Plant Food move is also incredible – try using it when zombies walk over a Spikeweed or get close to your Wall-Nuts/Infi-Nuts – they’ll continue taking damage even while stuck. Keep an Iceberg (or if you prefer a Cherry Bomb) on hand to disrupt problematic zombies. 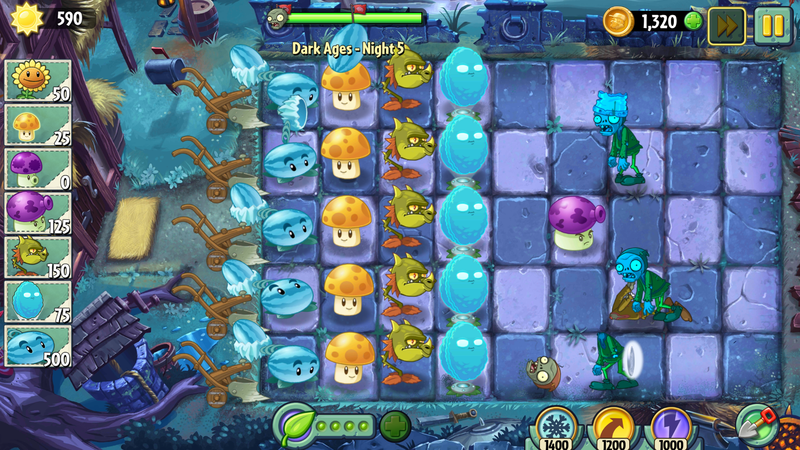 An example of the above strategy in action, this time with only Sun-shrooms, Winter Melons, Snapdragons, and Infi-Nuts. Puff-shrooms were previously out front. As the levels get tougher, the possibilities become endless as you acquire more plants. I wrote the above framework because it can be executed with plants acquired early in the game. You can replace or supplement the Spike Traps with Red Beans. Also, if you can afford it, Winter Melons are even better than Kernel-Pults. You may want to throw in a kew Coconut Cannons or Citrons or even Magnifying Grasses (powerful with Twin Sunflowers) for added power. Also, once you have a huge amount of sun accumulated, dig up the sunflowers and plant either Potato Mines or Kernel-Pults in their places. I won’t cover the plants that require real money to purchase. You’re wasting your money if you buy them since they’re only there to help you win a little quicker – no stage is so hard that you’ll need to be bailed out by an exotic specimens. Here is a quick rundown of what each standard plant does. It’s iconic, but not that good. It’s slow and outclasses by others. This plant is great in Ancient Egypt but average elsewhere, once you’ve gotten access to more powerful alternatives. Its Plant Food move is devastating, though, making it a solid option if you’re the type that saves up a lot of Plant Food to beat back big rushes. It’s best placed as far back as possible. It can also destroy graves in Ancient Egypt. A staple. It is both cheap and powerful, capable of dishing out lots of damage on top of delaying zombie progress. It’s free and good. It’s never a bad idea to have one on hand in case you need to freeze a torch-wielding zombie or anything problematic. A good close-range plant, best used in tandem with the Wall-Nut or Tall-Nut, but outclassed by the Dragonfire. Amazing – it can flame up to three columns at once, and when used in columns it’s almost unstoppable if protected by Wall-Nuts or Tall-Nuts. Even better. This + the Dragon/Wall strategy is a tall order for any zombie horde to overcome. Weaker than Wall-Nut, but regenerates its health. Usually not worth it unless you have incredible backup. Useful for breaking up rolling zombies and dishing out tons of damage while zombies try to chew through nearby Wall-Nuts or Tall-Nuts. Always place right in front of one of those two barrier plants. Super powerful – can break up multiple rolling zombies and does more damage than the Spike Trap. One-use plant that blows away all flying zombies. It’s worth getting this in the Far Future before making your way through the Pirate Seas – it’s the best way to deal with the macaws and seagulls. Shoots lasers. Economical (only 200 sun) for its power level. Useless. Knocks a zombie back but then has to recharge. Don’t bother. Also useless. You shouldn’t waste time or sun getting rid of graves. Just use Cabbage-pults, Kernel-pults and Bloomerangs to get rid of them while also damaging zombies. One-use but worth it. Instantly kills all zombies within adjacent tiles. Like the Coconut Cannon, but recharges/fires automatically, and is cheaper. A good investment. Instantly kills the zombie that eats it and then causes that zombie’s gas to temporarily paralyze the rest of the row. You can use these in place of Spike Traps within the Dragon/Wall strategy. Self-explanatory – a repeating Peashooter. A lot of power, but less versatile than the Kernel-Pult. Upgradable and capable of a lot of damage, but limited in its abilities and a bit slow, too. Tremendous. Does a lot of damage, justifying its high price tag. The creme de la creme. As powerful as a Coconut Cannon and as versatile as a Kernel-pult. Disables machines in the area. Worth it for sure in the Far Future to stave off big attacks. Uses up sun each time it attacks. But its attack is so powerful that the cost is worth it. Pairing it with a good store of Twin Sunflowers and/or Sun-shrooms is enough to hold even huge hordes at bay. Creates power tiles for plants (i.e., if one plant on a tile uses its plant food move, all other on the tile follow suit). Starts off free but becomes more expensive with each deployment. Not critical to winning, but not useless, eitehr. A scalable Sunflower – it produces more sun as it goes. A viable replacement for the Twin Sunflower. Causes zombies that have eaten it to drop sun when attacked. A bit win-moar, but useful if you’re leaning heavily on Magnifying Grasses. Takes away helmets and metal objects. Not usually necessary except perhaps in a few select Dark Ages levels. A building block in Big Wave Beach. They don’t do any damage, but you need them for expanding your presence over the water. Throws a ricocheting bowling ball at zombies. Doesn’t do much damage and is relatively expensive. Very good. Instantly takes out a zombie in water, for a low cost. Versatile. Can launch avocado seeds at zombies from afar, or chomp through them across the entire row if its proximity trigger is triggered. Incredible power and reach, but slow and expensive. Still, a backrow full of these can deal with just about anything. Essential for getting through Frostbite Caverns. Free and melts any frozen object (your own or an enemy). Basically an upgraded Cabbage-pult. Doesn’t seem to do as much damage, but heats up nearby tiles to melt ice. Excellent defense for flinging back big rows of zombies, but you’ll rarely need its power if you just use Wall-nuts etc. Not that great on its own, but in rows it’s good since it gives you great coverage and lots of cascading damage. -Tombstones are annoying, but don’t waste your time with the Grave Buster. It’s free, but planting it wastes time, and the graves respawn. Instead, try this: Plant a wall of Wall Nuts, then back them up with a row of Bonk Choys. Finally, behind the Choys, plant the Bloomerangs. The combination of Bloomerang/Bonk Choy gets rid of the graves, and, paired with the Wall Nut’s defense, mows down almost any zombies. This strategy works like a charm in the plan-your-defense levels in Ancient Egypt, in which you start out with a certain level of sun and can’t acquire any more. -Early on, you may have a pressing need for mass removal but won’t have enough coins for the power ups. The Cabbage-pult (only 100 sun) is your best bet. Its plant food move (plant food is earned from glowing green zombies and temporarily boosts the power of the targeted plant) is devastating. -It’s usually a smart move to include the Iceberg Lettuce in your arsenal. It’s free and it’s the best way to stop the flaming zombies. -It is totally worth your time to use your first key and go into the future to get the Laser Bean (you only have to beat one level there). In the defensive levels, you can set up two Laser Beans in each column and then one column of Wall Nuts – that should be enough to hold back any advance. -The Dr. Zombie battle is random; get used to this, and don’t expect to wear it down with strategy. Your best assets here are the Iceberg Lettuce and the Cabbage-pult. -The double sunflower is your best friend – having a row of five is a sun-making machine, but you have to set it up right. A trick to use is to add both the basic sunflower AND the double one to your arsenal. Start off with a few basic sunflowers, then plant some doubles once you have enough sun. That way, you lay the foundation for strong infrastructure while also getting things off to a quick start. Once you get the shovel power ups, you can shovel up the basic sunflowers to recoup some of the cost and then replace them with doubles. -The Kernel-pult makes the Cabbage-pult obsolete, and it is actually one of the best plants in the game despite costing just 100 sun. It can both damage enemies with kernels and slow them down with butter – its plant food move essentially freezes the entire zombie army for a few seconds. It’s usually a good idea to fill an entire back row with them. -There are some tricky “protect the endangered plants/don’t let the zombies trample the flower” levels in this world. A good strategy is to build a row of Wall Nuts to protect the flowers, and back them up with lots of Snapdragons for cascading damage. In the levels in which the endangered plants are right near the water, you’ll need to act quickly and build up lots of sun so that you can pepper the back row with Coconut Cannons. These can instantly blow away the cannon zombies before they even launch. -The mine carts give you a lot of flexibility in moving powerful plants up and down. It’s tempting to put a Coconut Cannon in one of them, but a better bet is the Repeater or the Threepeater. The latter does widely distributed damage, but the Repeater is arguably a better deal – remember that its plant food power up can be exploited after you start it by moving the cart up and down so that you can pick off zombies across multiple rows. -The Chili Bean is amazing – for only 50 sun, you can instantly kill a zombie and paralyze an entire row for a few seconds. Don’t upgrade to the Chili Pepper for $2.99, it’s a ripoff. -The Melon-pult is ridiculously powerful, but its high cost and slow rate of fire make it hard to utilize, especially in the complex levels with tons of chickens. You’ll need Lightning Reeds to fend off those chickens, which can easily slip past your other defenses. -The Laser Bean is deceptively powerful – it makes huge rows of regular, unupgraded/non-hardened zombies easy to deal with. But it’s more useful in Ancient Egypt than here. -The power-up squares are interesting, but the strategy is usually simple: put two Winter Melons on matching symbols and watch as you clear the board each time you get ANY Plant Food. However, it’s also worth putting Twin Sunflowers or just plain Sunflowers on the tiles for huge sun bonuses to power. -Magnifying Grasses! These guys are amazing. Once you get them, you’ll need almost nothing else. They can kill most zombies with a hit, and their Plant Food Move is great. Try it with the power-up squares: it’s a complete board-clearer. -Puff-shrooms are the backbone of good strategy throughout the Dark Ages. Plant them back to back to give you free short-term damage and deterrence. You won’t need much attack other than these and maybe a few Magnifying Grasses here. -The strategy at the top of the page isn’t so great here due to the preponderance of gravestones and potion-enhanced zombies. Keeping tidy rows won’t be as easy. Lean on the temporary threat of Puff-shrooms as well as the raw power of Magnifying Grasses (backed by Sunflowers and Sun-shrooms!) to carry the day. -Magnet-shrooms are overrated. They can weaken a group of bucket heads, but most of the the time you can beat them down anyway with Melon-pults and Snapdragons. -The Lily Pads are a necessary evil for expanding your reach in most levels here. They don’t do anything except give you a base to plant more plants on the water. -Tangle Kelp should be utilized in just about every level. They’re useful for taking out the tough surfer zombies and other armored zombies. -Bowling Bulbs are pricey for what they are. You can usually get a better setup by just waiting to build Banana Launchers that can take out just about anything. -Guacodiles are really good and cheap. But be careful of using them in levels where you can’t lose more than [x] plants – each time one goes off chomping, it’ll count against your total. 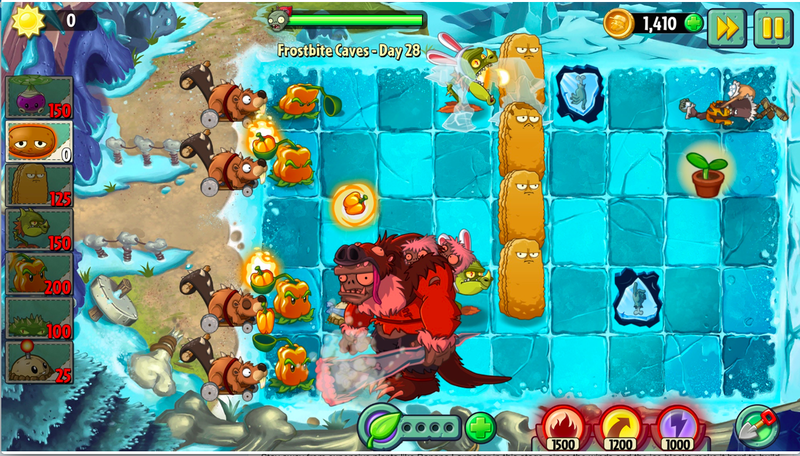 -The Hot Potato is essential for just about every level here to stop the big rows of ice blocks that the zombies will push over your defenses. -Use Snapdragons as part of the standard defense described here in intro; they’re even better here since the flames also help melt any frozen plants pretty quickly. -Stay away from expensive plants like Banana Launcher in this stage, since the winds and the ice blocks make it hard to build up and sustain a major legion of plants. Stick to Pepper-pults, Snapdragons, Stunions and Rotobagas.